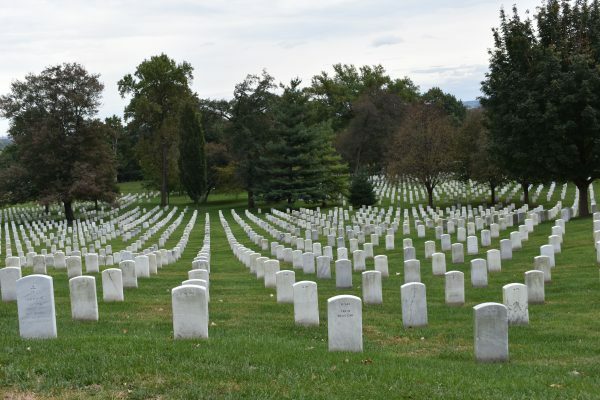 If you go to Washington, DC, you must visit Arlington National Cemetery. There are some amazing things to see. It is also a very touching, almost spiritual, experience that even our young boys could feel. First of all, you have some options as to how to explore Arlington. Most people walk to the most notable sights that we mention below. The distances aren’t too far in most cases, but the walking is primarily uphill, and you must stick to the roads and not cut through the memorials. It is a lot of walking if you want to see all of Arlington. The second option, which we took, is to ride the narrated tram. Though somewhat expensive, the tour is really nice. It takes you to all the major stops and gives you information that you won’t get by walking through the cemetery. The tour stops at 7 different stops, and you can hop off the tram to visit the stops you’d like. Then you can get back on the next tram that comes by. For more information on prices and times, visit their website. 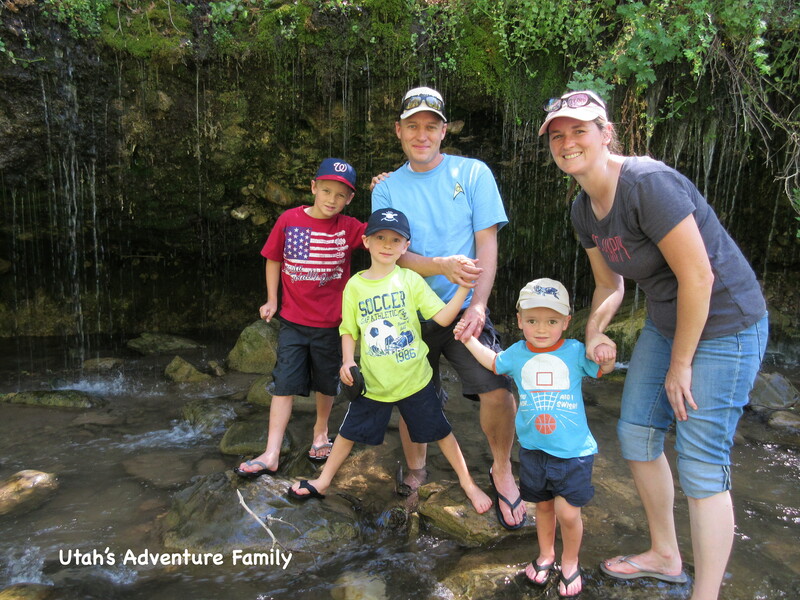 If you have the time and money, we recommend the tour. If you want to keep it short and inexpensive, just walk. 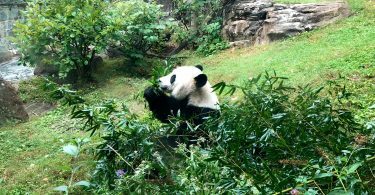 We loved our tour and it saved our feet from walking after we had worn them out all through D.C. 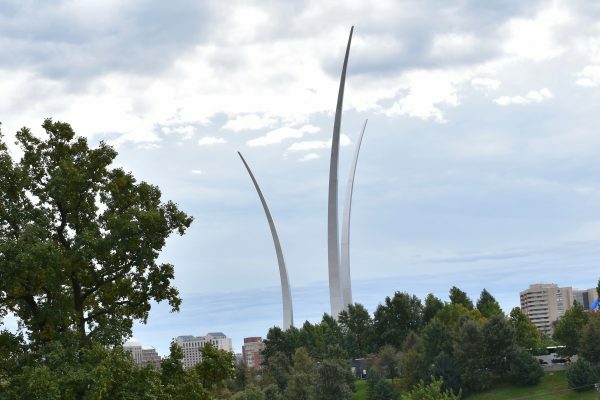 This is the Air Force Memorial. We would have never seen it without taking the tour. 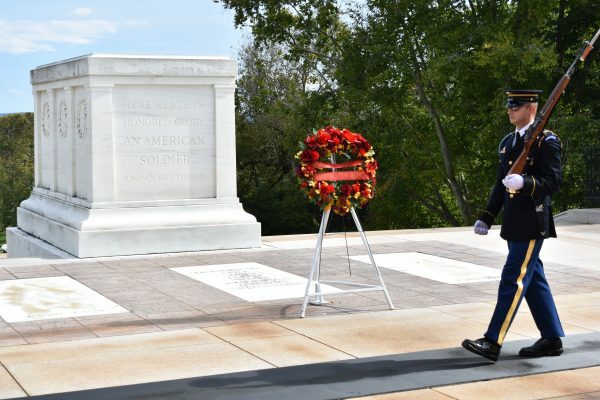 The main thing that people want to see is the changing of the guard at the Tomb of the Unknown Soldier. It is a relatively short walk, and there are many people along the way. 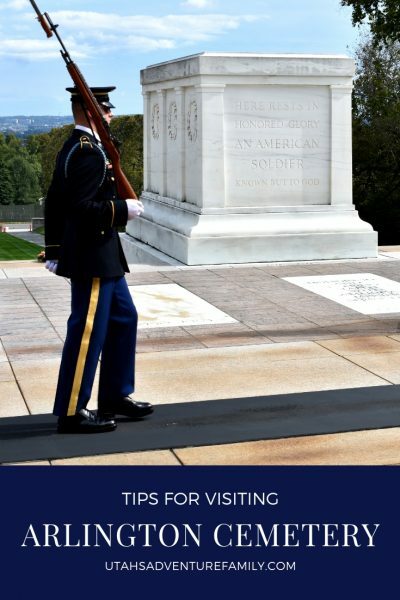 When you arrive at the amphitheater, go to the east side to see the tomb and the soldier guarding it. Since the tomb is guarded constantly, the guard will certainly be there. Watching the crispness with which he or she performs this duty is inspiring. At each turn features a loud heel click. Occasionally the guard reminds you to remain silent at the tomb. The guard changes every hour, on the hour from October-March. April-September it is changed every half hour. This is the main thing people want to see. 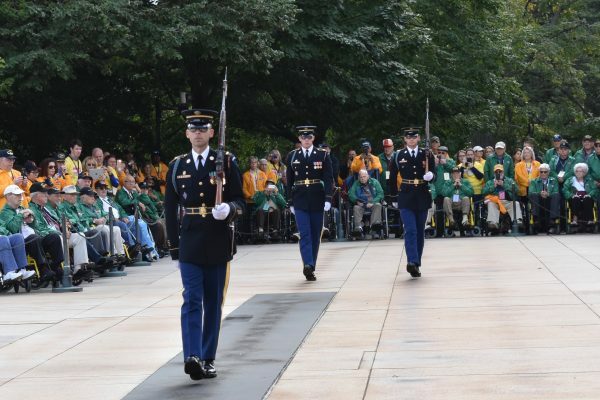 If you’re lucky, you may even see a wreath laying ceremony, which includes the playing of Taps. It is a very special ceremony to watch the changing of the guard. They are so precise and focused. We really enjoyed the wreath laying ceremonies because we loved hearing Taps played by the bugle. Watching the guard keep vigil is neat all by itself. Another important stop at Arlington National Cemetery is the Kennedy Gravesite. 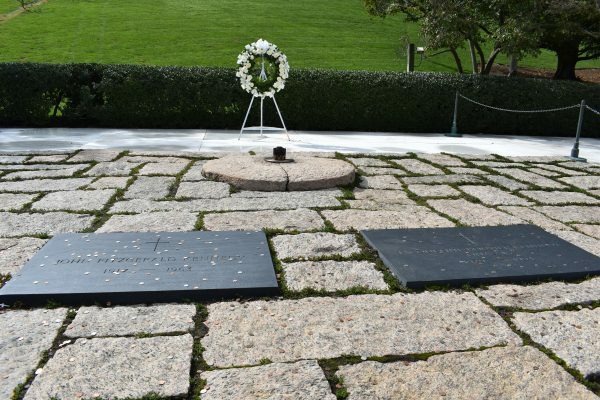 President Kennedy and his brothers, as well as his wife and two of his infant children are buried at this site. There is an eternal flame that burns, which keeps the memory of John F. Kennedy alive. This is a popular spot, and it isn’t too far from the Tomb of the Unknown soldier. Most people see these two sights and leave Arlington. Our boys know a lot about JFK, so they were excited to see the Eternal Flame. Most people miss the Iwo Jima Memorial because it is quite a walk. This is the Marine Corp Memorial, better known as the raising of the flag at Iwo Jima. This monument is on the outer loop of Arlington, and since you can’t drive to it, many people miss it. The tram tour is the best way to see it, and since there was construction in this part of the cemetery, we missed it anyway. 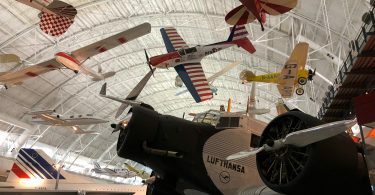 There are dozens of special sites to see including the graves of presidents, Audie Murphy, the Arlington House, Civil War Memorials, and the mast of the USS Maine. There is also a small museum/visitor center when you first arrive and go through security where you can get information about Arlington National Cemetery. 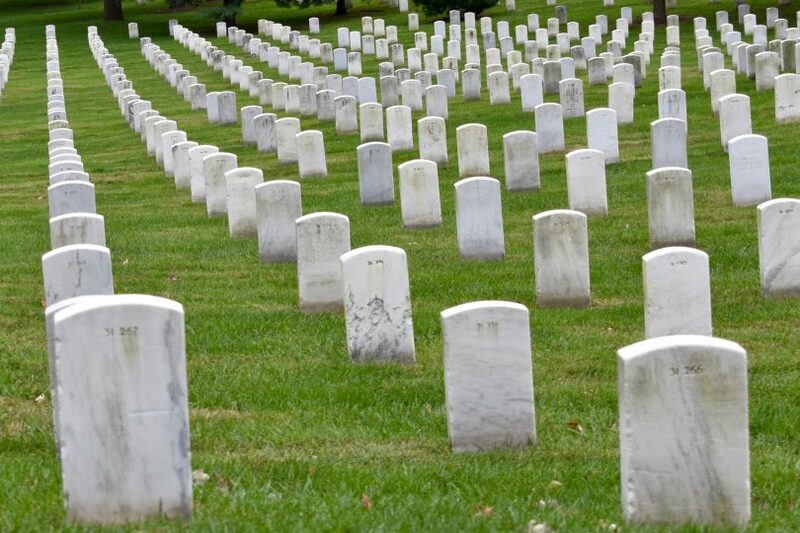 Perhaps the most impressive things to see are the rows and rows and rows of headstones lined up like soldiers over hundreds of acres. 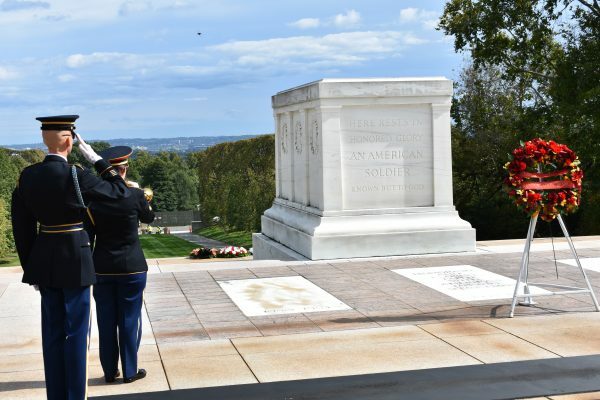 It gives you an opportunity to contemplate the sacrifices that have been made for our country. It is overwhelming to see so many tombstones. We learned a lot about how they are built and made on our tram tour, too. 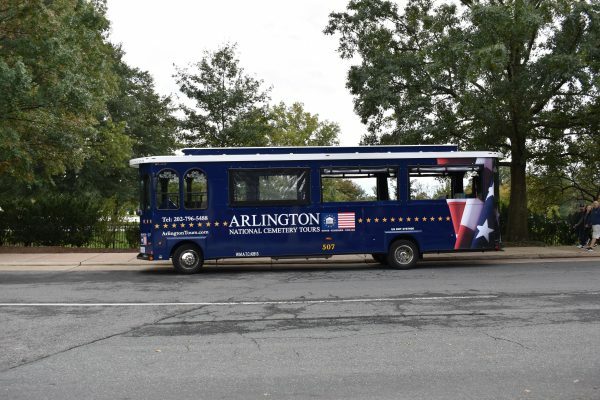 Plan to send at least 2-3 hours at Arlington, especially if you ride the tram. The driving part of the tour takes 45-60 minutes, and that doesn’t include getting off for stops. Make sure to arrive early for the changing of the guard so you can find a spot to sit or stand where you are able to see. They do not wait. Once the clock chimes, they will begin the ceremony. From April through September the guard is changed every half hour, but from October to March the guard is only changed every hour. Discuss the significance of the cemetery with your children, and prepare them to show respect throughout the grounds. Parking is $2/hour, but there is plenty of it. 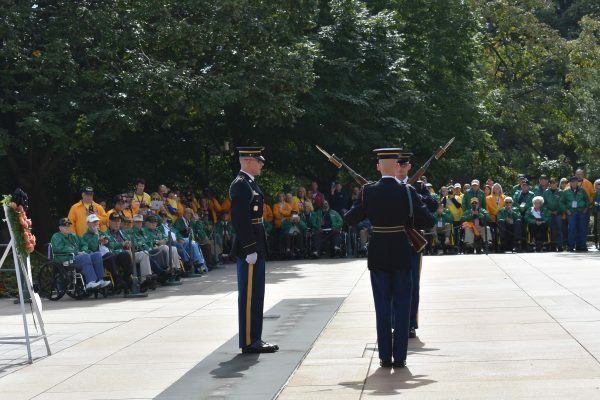 For more information, go to the official Arlington Cemetery site.